Legal practitioners, academics and energy industry representatives from several European countries contribute towards an appreciation of current and proposed EC energy legislation and policy. Legal and policy considerations of EC energy regulation are critiqued and their practical implications, particularly for the oil and gas industry, highlighted. The increasing role of environmental regulation and its potential impact on the energy industry is discussed in the light of current and proposed EC legislation and the case law of the European Court of Justice. Special emphasis is also placed on current key commercial issues facing the oil and gas industry such as abandonment and the current and future role of novel forms of energy financing. Finally, important considerations in North Sea Joint Operating Agreements and EC gas contracts are analysed in depth. 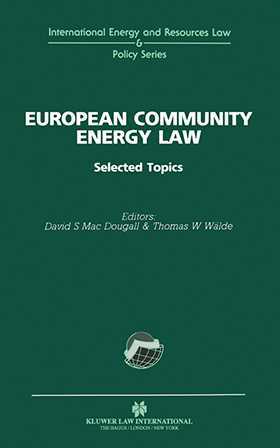 Introduction: European Community Energy Law in Perspective. Section 1: European Energy Policy. Section 2: European Energy Legislation. S ection 3: Environmental Law. Section 4: Oil and Gas. Section 5: Energy Financing. Index.